For sale is a 3KW Sonics & Materials Vibra Cell Ultrasonic Ultrasound Power Generator VC3000. Cavlon Item # 85. Up for sale is a 50 Khz 96 Watt MEGASON Super Deluxe Compact Ultrasonic Cleaner power unit. Cavlon Item # 267. Up for sale is a CREST ULTRASONICS Genesis 4G-250-3-PW 250 watt ultrasonic generator. Cavlon Item # 112. Up for sale is a Richard Wolf 2161.00 PACSystem 3000 Programable Ultrasonic Generator with foot pedal. Cavlon Item # 955 Raw weight is 14 lbs. 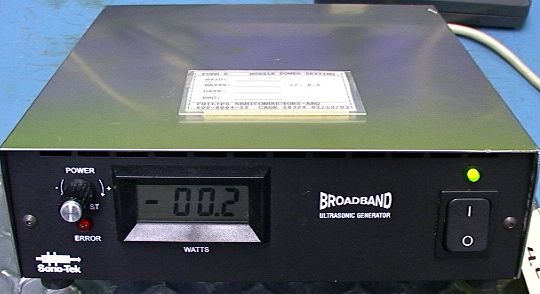 0For sale is a Sono-Tek BroadBand UltraSonic Generator Model # 06-05108. Cavlon Item # 3403. Raw weight is 4 lbs. Raw dimensions are 8.5*10*3"